Published: June 22, 2018 at 10:25 a.m. Updated: June 28, 2018 at 11:31 a.m. If you want a close look at as many NFL draft prospects on one field as possible this fall, there are plenty of college games that belong in the can't-miss category. Our 18 for '18 series continues with a look at some of the most prospect-laden games on the schedule. With a strong reliance on NFL.com analyst Chad Reuter's top 150 list, these games will be big draws for NFL scouts. To help diversify the matchups selected here, no program is involved in more than three games that made our list. Matchup to watch: Oklahoma WR Marquise Brown vs. West Virginia CB Hakeem Bailey. The offensive firepower that will take the field here foretells a classic Big 12 shootout. 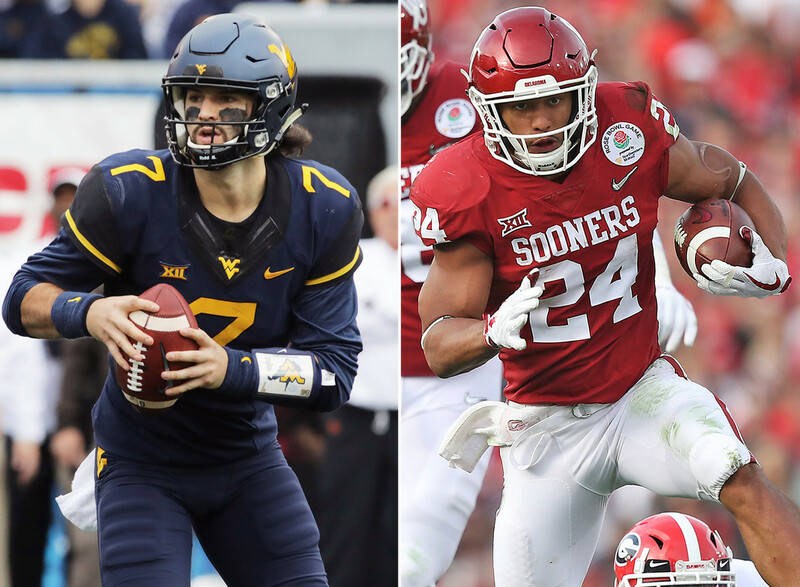 The host Mountaineers will feature one of the most prolific pass combinations in the nation in Heisman Trophy contender Will Grier at QB, and WR David Sills V. The Sooners have a star RB in Rodney Anderson, who was unstoppable over the second half of last season. QB Kyler Murray, who is expected to replace Baker Mayfield, is a dynamic athlete, although his pro baseball future makes his status as a draft prospect unclear. He's signed as a first-round MLB pick with the Oakland A's, but intends to direct the Sooners offense this fall. Matchup to watch: Florida WR Tyrie Cleveland vs. Georgia CB Deandre Baker. This annual neutral-site clash always draws the scouts, and 2018 won't be any different. Florida LT Martez Ivey, who strongly considered entering the 2018 NFL Draft as an underclassman, will lead a Gators OL that will return all five starters. Senior DE Cece Jefferson could be primed to finally have the breakout season UF fans have awaited under first-year DC Todd Grantham. Georgia, meanwhile, is loaded at the offensive skill positions with QB Jake Fromm, RB D'Andre Swift, and WRs Terry Godwin and Riley Ridley. Matchup to watch: Washington OL Kaleb McGary vs. Oregon DE Jalen Jelks. The Pac-12's two most talented passers, arguably, will square off here (UW's Jake Browning, UO's Justin Herbert.) That should draw more than a few NFL scouts, particularly from clubs who could need a QB in the 2019 draft. Browning won't have to do it all himself, however. Washington's run game, led by OT Trey Adams and RB Myles Gaskin, will be formidable. Matchup to watch: Boston College OL Chris Lindstrom vs. Clemson DE Clelin Ferrell. One of the top young rushers in the nation, BC's A.J. Dillon, awaits Clemson in Chestnut Hill. Dillon was the ACC Rookie of the Year in 2017, rushing for nearly 1,600 yards. The Eagles defense features DE Zach Allen, who made eight tackles against the Tigers last year. Clemson has a dynamic DE tandem in Austin Bryant and Ferrell. Plus, a breakout season could be coming for talented RB Travis Etienne. Matchup to watch: Penn State QB Trace McSorley vs. Wisconsin DB D'Cota Dixon. Penn State DE Shareef Miller will have a great chance to impress scouts against a Wisconsin offensive line that should be one of the nation's best. If he can't get off blocks against the Badgers, it bodes all the better for Wisconsin RB Jonathan Taylor. Badgers LB T.J. Edwards was a first-team All-American last year, but received a recommendation to return to school by the NFL Draft Advisory Board. He did just that, and will be looking to show scouts improved speed this fall. Matchup to watch: Georgia RB D'Andre Swift vs. Auburn LB Deshaun Davis. You'll be hard-pressed to find a more highly anticipated QB battle than Jarrett Stidham vs. Jake Fromm. The latter isn't in play for the 2019 draft -- he's only a true sophomore this fall -- but after beating Stidham head to head in the SEC Championship Game last year to earn a spot in the College Football Playoff, he earned his stripes as a freshman. The game will also feature two of the top cornerbacks in the SEC in AU's Jamel Dean and Georgia's Deandre Baker. Matchup to watch: Miami WR Ahmmon Richards vs. LSU CB Greedy Williams. Mark this game down as one of the true non-conference treats being played in Week 1. Richards is among the fastest players in the game, and will be looking to put a frustrating 2017 season of injuries behind him. Williams is next up in LSU's long line of pro-bound cornerbacks, and in fact had more ball production last year than Carolina Panthers second-round pick Donte Jackson (Williams led the team with 6 INTs and 17 passes defensed). Keep an eye on LSU LB K'Lavon Chaisson, who could be primed for a breakout season. Matchup to watch: OSU OT Isaiah Prince vs. TCU DE Ben Banogu. After splitting a two-year home-and-home series with Oklahoma, the Buckeyes add a new Big 12 opponent to the schedule in the Horned Frogs. The game will feature elite speed on the perimeter, at both wide receiver (OSU's Parris Campbell, TCU's Jalen Reagor and KaVontae Turpin) and cornerback (OSU's Kendall Sheffield, TCU's Jeff Gladney). Matchup to watch: Notre Dame TE Alize Mack vs. Michigan S Tyree Kinnel. The Fighting Irish host a huge opener here with intriguing talents at all three levels of their defense: DL Jerry Tillery, LB Te'von Coney and CB Julian Love. Michigan's offense will counter with a new QB in transfer Shea Patterson and a proven RB in Karan Higdon. The revamped left side of Notre Dame's offensive line will get a stiff early test against the Wolverines' Rashan Gary and Chase Winovich. Matchup to watch: LSU WR Jonathan Giles vs. Alabama CB Trevon Diggs. This game is always heavily attended by scouts, and usually, their heads had better be on a swivel, because draft prospects are all over the field. LSU LB Devin White rated first-team All-SEC last year as a true sophomore. He'll be largely tasked with containing Alabama's top rusher, Damien Harris. Another top prospect to watch: Crimson Tide OT Jonah Williams, who can play either the left or right side with dominant effectiveness. Matchup to watch: Stanford WR J.J. Arcega-Whiteside vs. USC CB Iman Marshall. The Trojans will travel to Stanford with half a dozen players from NFL.com analyst Chad Reuter's top 150, including a pair of linebackers in Cam Smith, a fourth-year starter inside, and Porter Gustin, a gifted edge rusher. They'll have their hands full with a legitimate Heisman Trophy contender in Cardinal RB Bryce Love, a dangerous breakaway threat who set an FBS record last season with 13 rushes of 50-plus yards. Matchup to watch: Alabama C Ross Pierschbacher vs. Missouri LB Cale Garrett. The always-tough Alabama defense draws one of the best quarterbacks in the nation in Drew Lock, who enters his fourth year as a starter. Missouri senior DL Terry Beckner is a disruptive force up front who hopes to put together his second consecutive healthy season for NFL scouts. Crimson Tide OT Jonah Williams, a junior, will be heavily scouted this season and is a strong candidate for the Outland Trophy (nation's top lineman). Pass-rushing Alabama LB Terrell Lewis, injured for much of last season, will turn scouts' heads with his size and power. Matchup to watch: FSU RB Cam Akers vs. Miami LB Shaquille Quarterman. One of the college game's most bitter rivalries returns to Miami Gardens with its typically strong contingent of skill-position athletes. Miami's Quarterman enters his third year as a starter (in 2016, he became UM's first true freshman starter at middle linebacker since Dan Morgan in 1998). He and S Jaquan Johnson are two of the nation's top defensive players. The Seminoles counter with QB Deondre Francois, Akers and a small-but-intriguing WR prospect in Nyqwan Murray. Matchup to watch: Ohio State WR Parris Campbell vs. Penn State CB Amani Oruwariye. Nittany Lions QB Trace McSorley gets a home-field chance to exact some revenge from a 39-38 loss to the Buckeyes last year, but he'll have to do it in a transition year for the offensive weapons around him. He'll also have to do it against another dynamic OSU defensive line, led by DE Nick Bosa and DT Dre'Mont Jones. Matchup to watch: Auburn DE Marlon Davidson vs. Alabama OT Jonah Williams. The NFL factory that is Alabama football will showcase most of the future pro talent in the Iron Bowl, but the Tigers have plenty of their own. Cornerbacks Jamel Dean and Javaris Davis are speedy, talented cover men who will give Auburn's defense more freedom to blitz, and on offense, QB Jarrett Stidham is one of the nation's best passers. Alabama DE Raekwon Davis and LB Mack Wilson are All-SEC talents, and the Alabama offense is once again loaded in the backfield, led by senior Damien Harris. Matchup to watch: FSU DE Brian Burns vs. Clemson OT Mitch Hyatt. The ACC Atlantic Division standings can't really take shape until this annual rivalry has its say. Clemson's vaunted defensive line can swallow an offense whole, led by DTs Dexter Lawrence and Christian Wilkins. They'll be looking to bottle RB Cam Akers, who broke Dalvin Cook's FSU freshman rushing record last season with 1,025 yards. Matchup to watch: Michigan DE Rashan Gary vs. Wisconsin OT David Edwards. The line of scrimmage will be well worth watching when Wisconsin has the ball. The Badgers return all five starting offensive linemen, including standouts Edwards, Michael Deiter and Beau Benzschawel, in front of star sophomore RB Jonathan Taylor. They'll be trying to break through one of college football's stoutest defensive fronts, led by a dominant tandem off the edge (Gary, Chase Winovich). Matchup to watch: Ohio State RB J.K. Dobbins vs. Michigan LB Devin Bush. One of college football's greatest rivalries will pit two deep stables of future pros, as well. Buckeyes DE Nick Bosa will be one of the most heavily scouted players in the nation as a junior this fall. They'll also return an elite rusher in Dobbins, and gifted QB Dwayne Haskins steps in as the program's promising replacement for J.T. Barrett. Michigan DE Rashan Gary is one of the game's most athletic defensive linemen, and Bush is a heart-and-soul leader for UM who will be crucial against OSU's rushing attack. Meanwhile, transfer QB Shea Patterson (previously at Ole Miss) will bring some much-needed excitement to the Wolverines offense.